Buenos Aires was not the first city to be established in Argentina, it was not used by the indigenous hunter-gatherer peoples as a settlement either. In 1535 however, Pedro Medoza a, Spanish aristocrat set up a port in the natural harbor created by the river delta. The Spanish then steadily colonized the area and Buenos Aires grew as a farming and trading community. However, Salta, Tucumán, Córdoba, and other Argentinian settlements were of more importance until the late 1700s. In 1776, while the whole area was still under Spanish rule, Buenos Aires was declared the capital of the Rio de la Plata region. A few decades later in 1810, independence was declared and many neighboring regions broke away to form their own states (Bolivia, Paraguay etc) soon after. The next century saw Buenos Aires expand greatly and find its own identity. Immigrants from Italy, Spain, Germany, the Middle East and many other places poured in to the swelling city. Most of the cultural and political aspects we associate with Buenos Aires were developed during this time and the country was becoming exceedingly wealthy. The Tango moved from being a working class entertainment to something everyone could enjoy and was interested in. Literature, radio, cinema and theatre all saw a boom at this time as well. People from rural areas longing to find fame and fortune, flocked to the city. 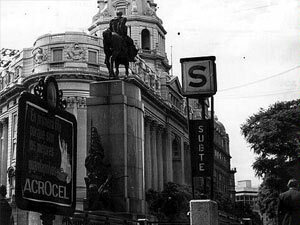 Political instability and the economic downturn in the ‘30s hurt the city, and by the time of World War II, Buenos Aires was another third world city, full of corruption, unemployment and high inflation rates. Juan Perón and his wife Eva Duarte (Evita) came into power at that time, and a short period of stability followed although that too was soon lost. In the 1970s, there was a civil conflict known as the ‘Dirty War’ where the guerilla group the Montoneros, turned against their government because of the corruption and mishandling of authority that was taking place. Most of the members of the group were ‘disposed of’ and many have still never been found or accounted for. This military leadership ceased in 1983 when Raúl Alfonsín took control with a new civilian government. Alfonsín’s successor Carlos Menem increased Buenos Aires’ influence and the city started to prosper again. The recent economic crisis however, shocked the city yet again and prompted Argentina to declare the world’s greatest default on public debt in 2001. The city was plunged into despair with many people suddenly finding themselves in dire straits. Since then, the city has been slowly recovering, primarily because of the new leader Néstor Kirchner. Tourism has been a major source of income, especially because of the low price of the peso. The people of the city have also been forced to turn to more home-grown things; Argentine leather and fabrics, local artists and performers for entertainment and Argentine food. This is increasing tourist appeal because of the strong culture that is being built up. The president now is Cristina Fernández de Kirchner, the wife of Néstor Kirchner. How her presidency will run is yet to be seen but Buenos Aires remains a surge of historical intrigue and political clashes. Its past can’t be hidden but porteños do a good job of moving on.